Ticket sales will end on Apr. 27, at 03:00 PM local time. 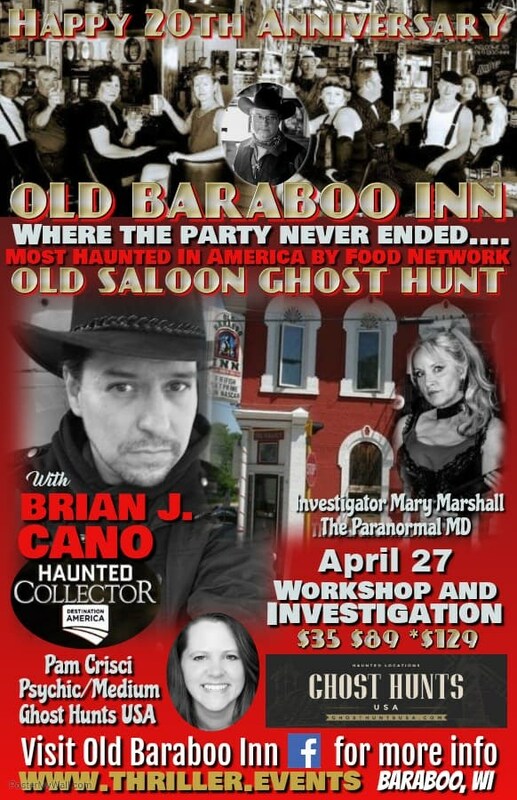 Celebrate the 20th Anniversary of the Old Baraboo Inn with Brian Cano, Para-Psychologist and Star of SyFy Channel’s Haunted Collector! The old Honky Tonk Saloon, Back Gangster Bar and the old secret second floor Brothel is sure to sizzle with evidence with the special techniques Brian Cano will teach you with his famed THE METHOD™. He will be joined with seasoned paranormal investigator, metaphysical sensitive, author and para-Psychologist, Mary Marshall, to assure an experience you will never forget! This will be Brian Cano’s first stop in the Midwest since his year-long sabbatical from his Paranormal celebratory tours, so make sure to give him a warm welcome! Special Guest appearance by Ghost Hunts USA, to help celebrate the hauntings of Old Baraboo Inn! To make this a special treat, Pam Crisi, a psychic medium, and one of the Ghost Hunts USA's Lead Investigators, will be there to help with the investigations! Who knows what else she will do! The Saloon will celebrate with its GHOST BOMB, a celebratory “Juice” that is sure to fire up the night! Add Paranormal Investigation from 6:30-10:30pm … Four hours of Intense Investigation! Includes all the Perks of the Anniversary AND the VIP Anniversary, plus a bunch more! Full dinner with Brian Cano “Round Table” gathering at 5PM before the hunt AND a Naughty Pajama Party upstairs in the Upstairs Secret Brothel starting at 11PM until 1AM. Doors Open at 1PM for Meet and Greet. Make sure to plan on getting Ghost Bombed with Brian Cano and Mary Marshall! Scheduled and/or posted Talent and Itinerary of the Event may be changed (with notice) due to unforeseen circumstances out of our control.